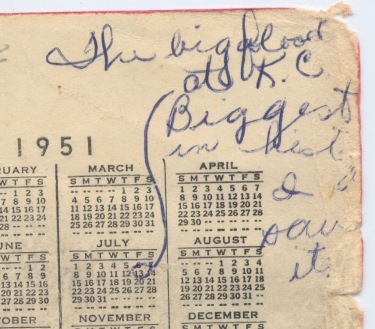 Hazel mentions in her diary that they listened to the boxing match between Sugar Ray Robinson and Jake LaMotta on the radio on this day in 1951. She said they were planning to go to the hardware store where there was a television set, so they could actually watch the match, but they didn’t. They really should have, because the fight was historically dubbed “The St. Valentine’s Massacre of Boxing,” named after a real St. Valentine’s Massacre from exactly 22 years earlier, also in Chicago. The historic boxing match was held in Chicago Stadium, and during the especially brutal 13th round, the crowd was calling for the referee to stop the fight. To quote the announcer: “Some of the crowd yelling ‘Stop it,’ but you don’t do that to a champion — you have to go out fighting.” To his credit, LaMotta never went down, but in this 6th and final match between the two of them, his title was lost to Sugar Ray. You can read a good article about it HERE. You can watch the 13th round HERE. You can watch the entire match HERE. You can read more about Sugar Ray Robinson HERE. Sugar Ray Robinson passed away in April of 1989, nearly 30 years before LaMotta. Went back to school today. Rode home with Daddy on tractor & wagon. Mary Ann was sick today. Opal’s going with Jerry Porter from New Cambria. Ordell Penton went by tonite on M.B. So Opal has a boyfriend . . . hmmm. There’s another thing I’m going to have to ask her about. I don’t know who Ordell Penton is. And she’s well enough to go back to school, although it seems sickness is making its rounds. I think it would have been fun to ride home on the tractor and wagon! On this day, Colleen Kay Hutchins, 25, of Salt Lake City, Utah, became Miss America 1952 . . . just a bit of trivia for you today. Today we’ll be working on Setting Block 6 again. 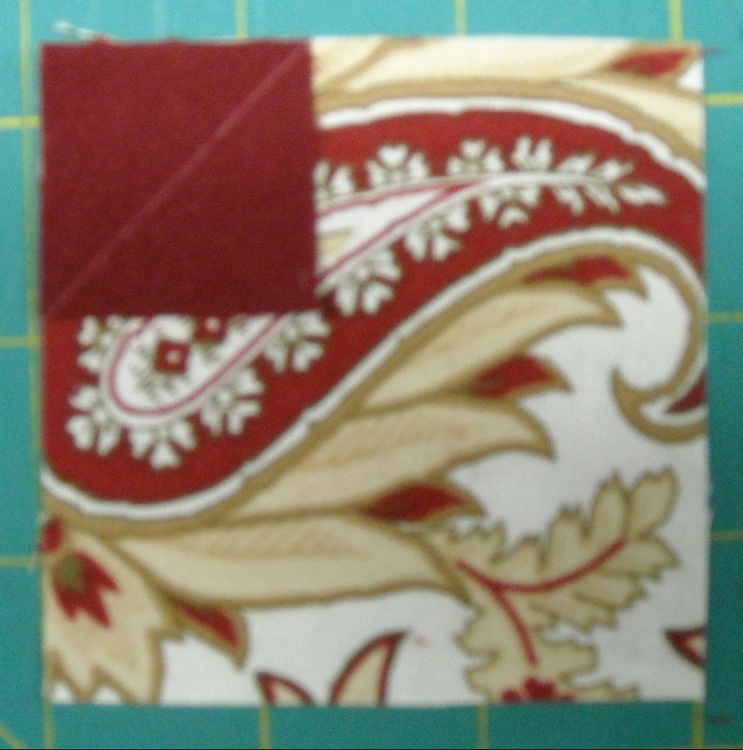 You’ll need the big Fabric #1 square and the four tiny Fabric #3 squares. 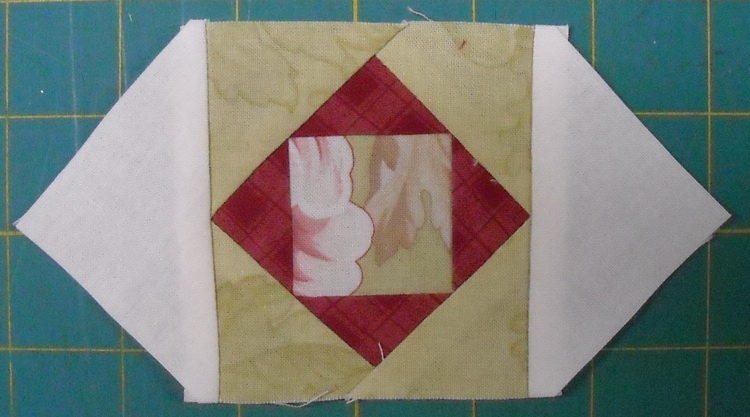 On the back side of each tiny square, draw a diagonal line with a marking pencil. Next, we’ll work with one square at a time. Lay a tiny square on one corner of the big square, right sides together, lining up the edges with the drawn line running as shown. 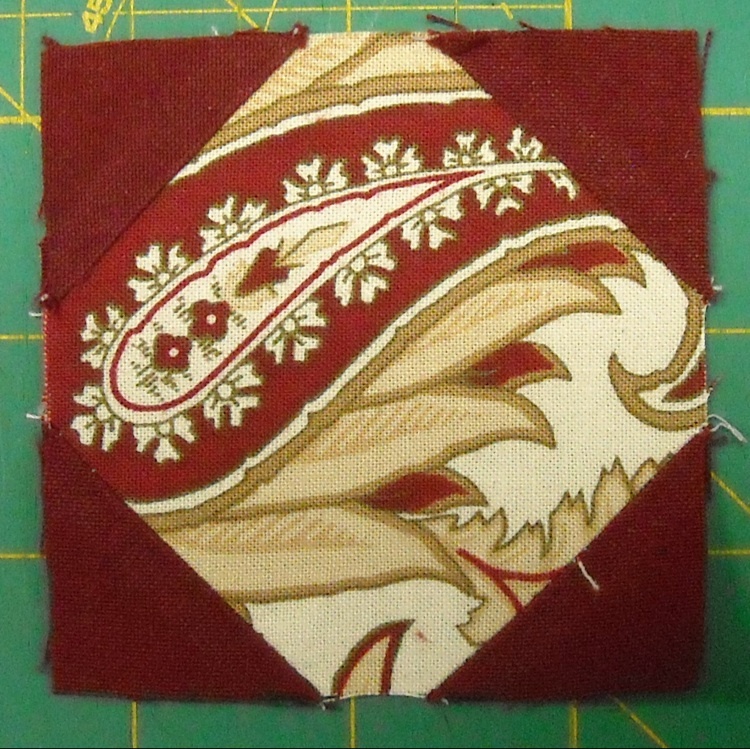 Pin in place, and stitch ON the drawn line from corner to corner of the small square. 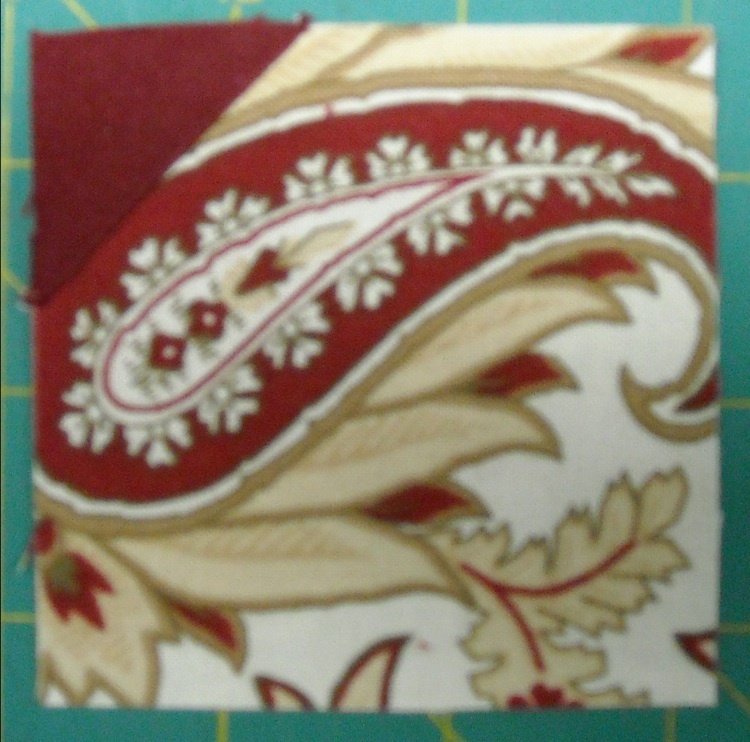 Trim off the excess fabric 1/4″ outside the stitched line. Press the triangle out. 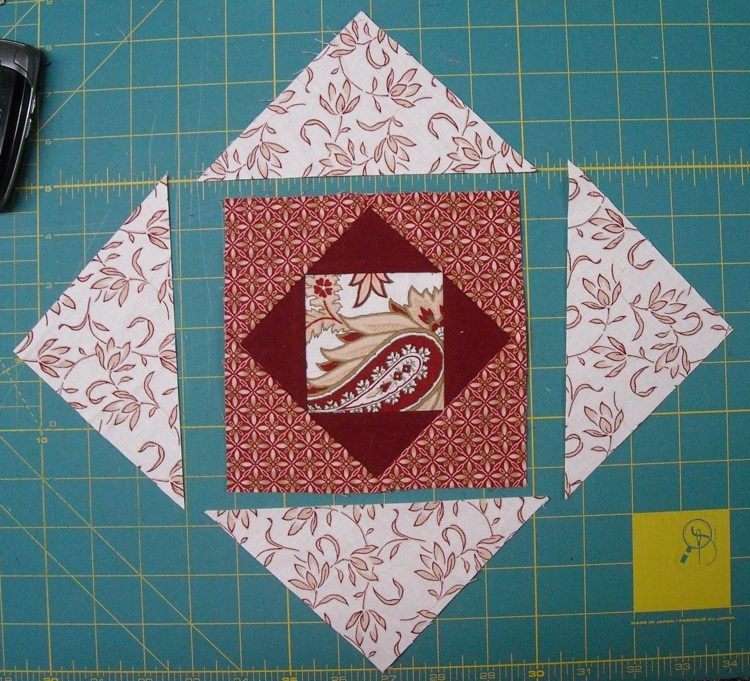 Repeat for the other three corners of the square, until your unit looks like this: Store it back in your “Setting Block 6” baggie. There is no step today for you Option 2 folks. See you tomorrow! Vern & Jo. came down tonite. Peggy was here part afternoon. Heard my name on radio & requests for family. Had a bad train wreck in Louisiana – 14 dead – 60 injured. 9 year old boy killed. More requests on the radio and hearing her name. I’ll bet she just loved that. There was a bad train wreck in Louisiana on this day. It occurred at about 7 a.m. in a desolate swamp area 60 miles northwest of Baton Rouge. A head-on crash between a Kansas City Southern Streamliner and a 300-marine troop train killed 12 persons and injured at least 60 others. The little boy she mentions was dubbed a “bystander” by the article I read. However, I’m wondering: If it happened at 7 a.m. in a desolate swamp area, how were there any “bystanders”, let alone a little boy? That part I just don’t get . 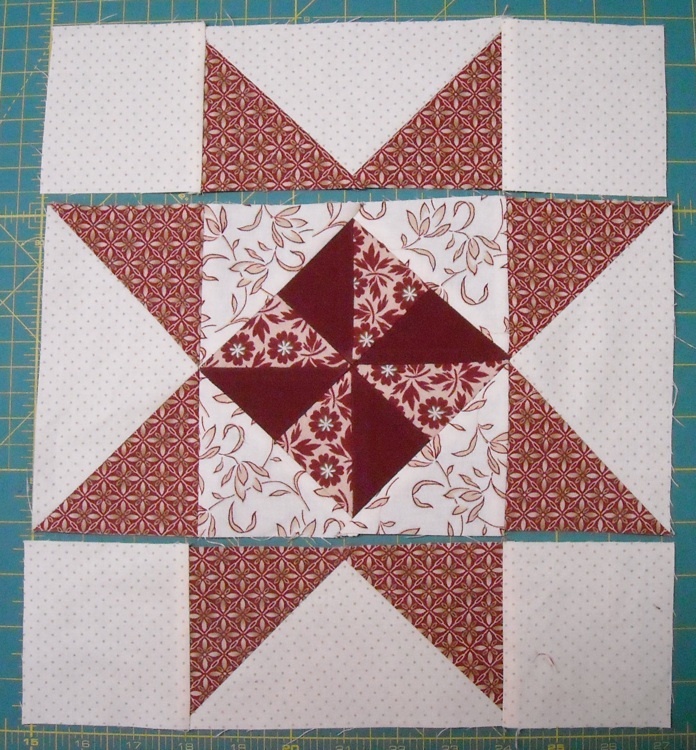 . .
Today you need the units you made yesterday, and the four remaining triangle units from your “Block 10” baggie. 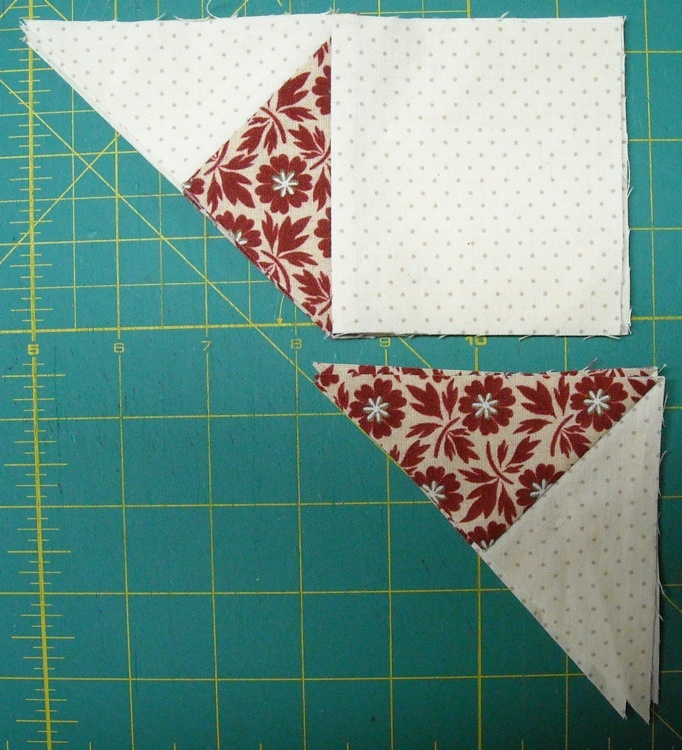 Lay them out as shown, making sure that Fabric #4 on the triangle unit is on the right. 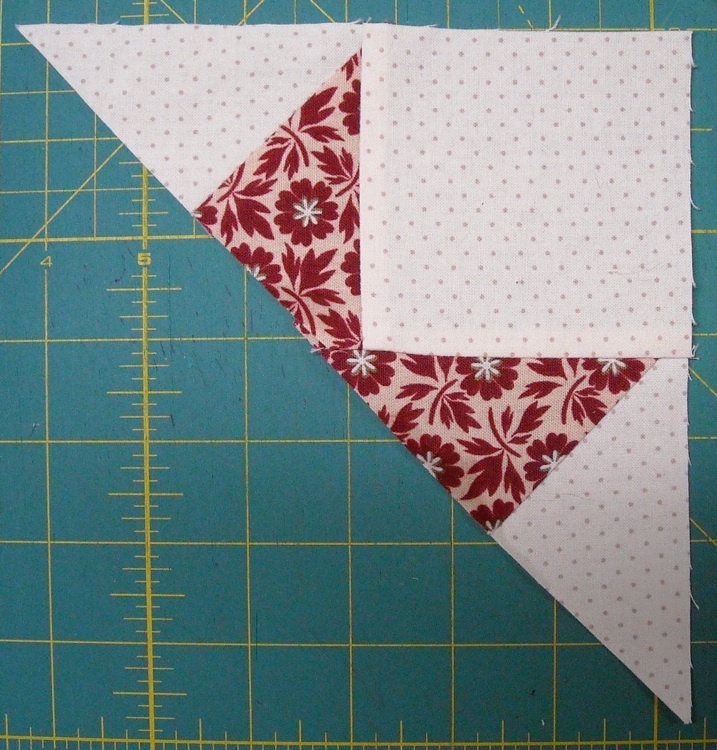 Flip the triangle unit up onto the square, right sides together, and stitch. Press the seam toward the square. Repeat for the remaining sets of pieces. Store them back in your “Block 10” baggie. Stayed home & watched television. (Jersy Joe (Ezzard Charles) Joe won). Ate supper while watching. Took care of Jerry again today. Mickey golfed till 8:00 o’clock. Bye. Still in Kansas City. Getting to eat supper in front of the television had to have been a real treat! Jersey Joe Walcott fought Ezzard Charles for the World Heavyweight Title in Pittsburgh. Jersey Joe won by a knockout, and the fight was dubbed the 1951 Fight of the Year by Ring Magazine. It was the first Heavyweight Title fight ever held in Pittsburgh. I’ll bet Vern wishes he could have been there to see it on television. 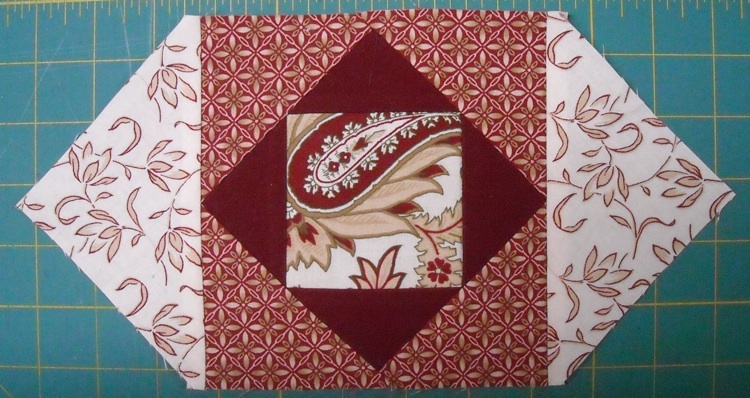 Today you’ll need the square-in-a-square pieced unit from your “Block 9” baggie, and the Fabric #7 squares. Lay them out as shown. 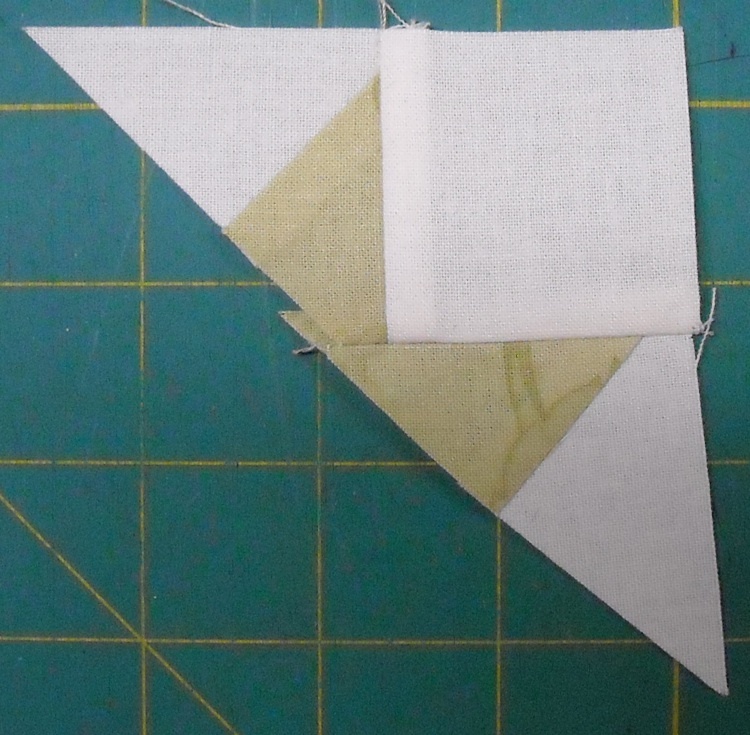 Stitch a triangle to each side of the center unit, pressing seams toward the triangles, and trimming the dog ears. Add the remaining two triangles to the other two sides. 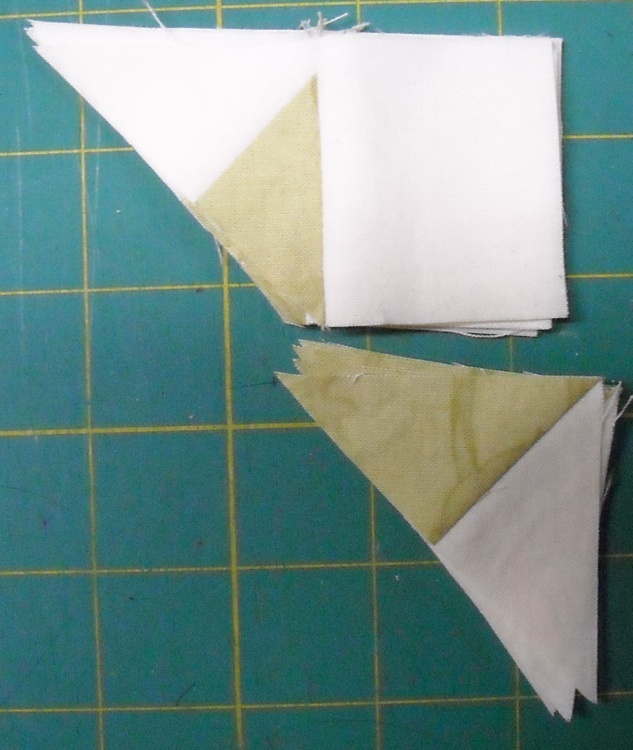 Press seams toward the triangles, and trim the dog ears. Store this back in the “Block 9” baggie. 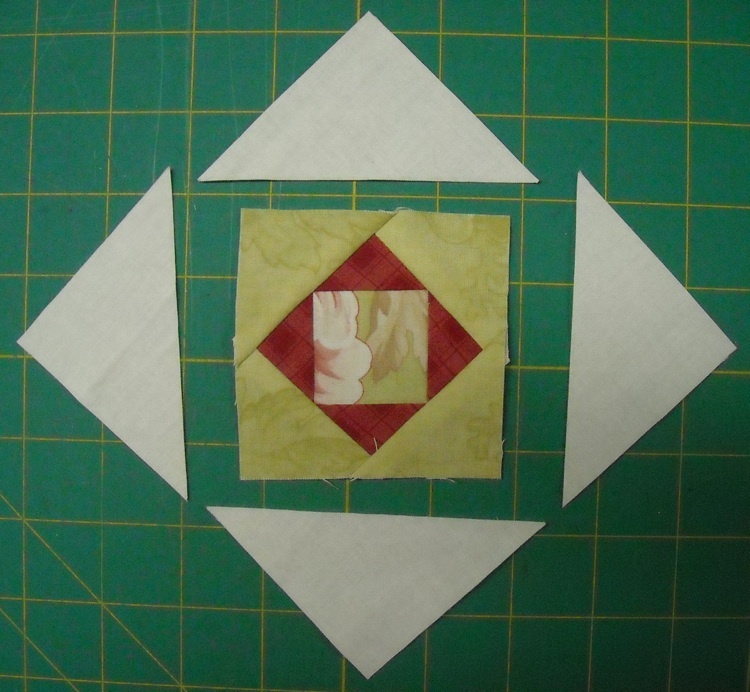 Today you’ll need the square-in-a-square pieced unit from your “Block 9” baggie, and the Fabric #4 squares. Lay them out as shown. The flood up here is awful. Worse than 1903 flood. We stayed up till 2:30 this morning. Northtown may be flooded. Moved people out of Harlins(?). Awful. She’s right . . . it’s awful. Northtown is flooded, and has been ordered evacuated. Other areas as well . . . The Kansas, Missouri, and Kaw Rivers are all out of their banks, and destroying homes and businesses all along their way. They probably stayed up so late because they were listening to reports about the flooding on the radio. Announcers were giving updates throughout the entire ordeal, and repeating the evacuation orders over and over again, trying to warn people to get out while they could. Miraculously, only 5 people died. This is one of the worst catastrophes to ever hit the Kansas City area. The devastation was as bad as if the city had been hit by a bomb. The Kansas City Star has a good book out that chronicles in detail the days of the flood. 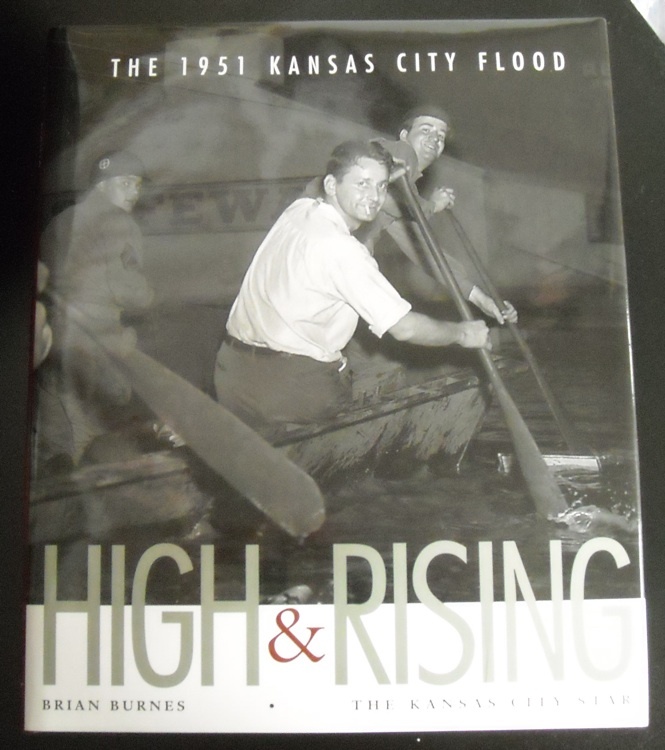 It’s by Brian Burnes, and it’s titled: “High & Rising: The 1951 Kansas City Flood” — if you’re interested in reading about this historical event, I highly recommend this book — it’s captivating, and has great photographs throughout. My sister loaned me her copy, and I read it through in one night, it was so interesting. Today you’ll need some pieces from your “Setting Block 5” baggie. 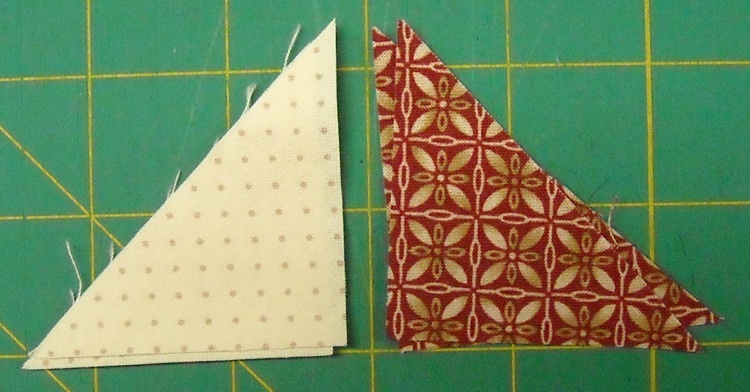 Take out two of the Fabric #4 triangles, and two of the Fabric #6 triangles. 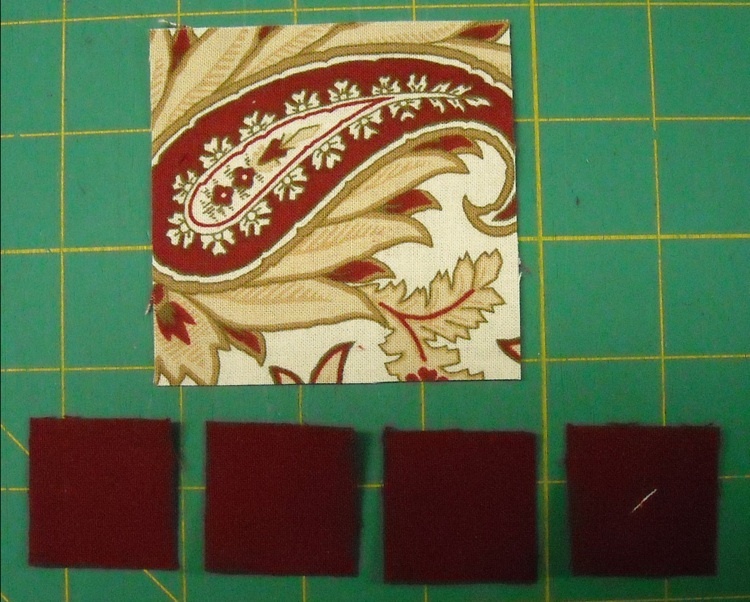 Lay them out as shown, making sure that you have them turned correctly, and that Fabric #4 is on the left. 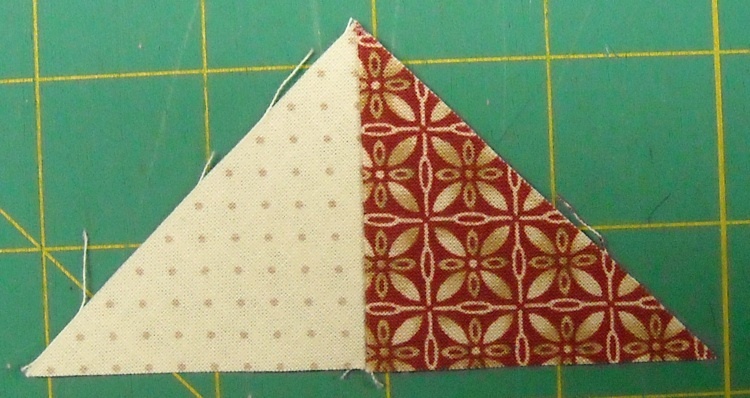 Match a pair of triangles up, right sides together, and stitch along the short edge. 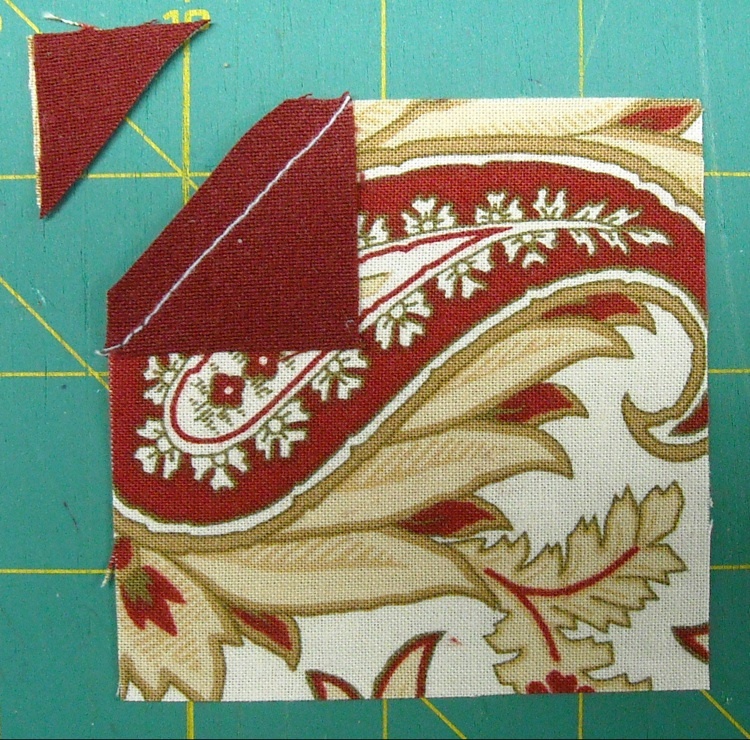 Press the seam toward Fabric #6, and trim the dog ear. You should now have a larger triangle. Repeat with the other pair of triangles. 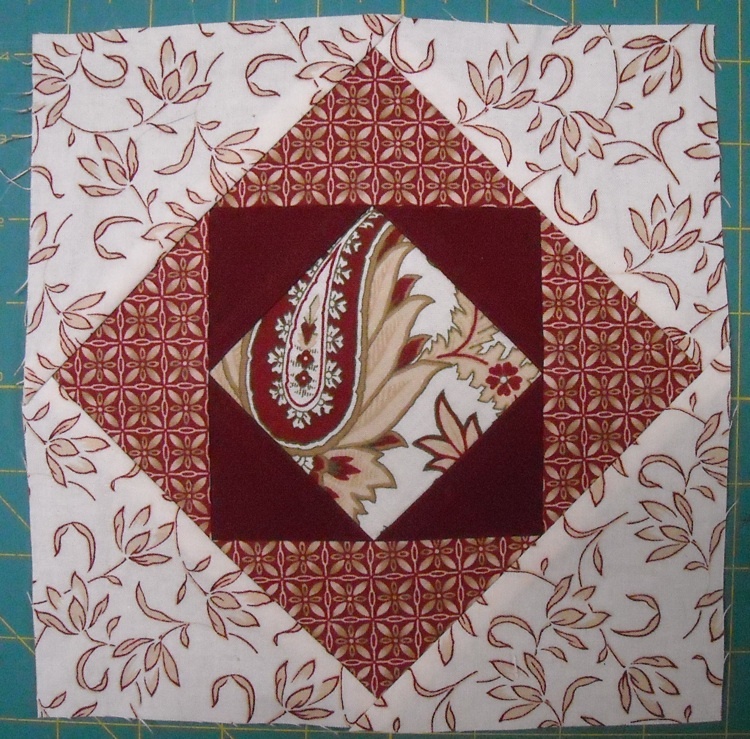 Store in the “Setting Block 5” baggie. There is no step today for all you Option 2 folks. Memorial Day — Went to show tonite, “Stampede,”. Real good. We drove out to cemetery before going to show. Reese was here for dinner. (Wait till Mary Ann hears). He worked for Daddy most of day. Listened to Ballgame. Lee Waller won International Speed Race at Indianapolis. I heard part of it. I watched “Stampede”. As old westerns go, it was pretty good. Sounds like maybe Mary Ann might have a crush on Reese? I have no idea what ballgame they might have listened to, I just know that Vern didn’t miss very many of them. He loved to listen to ballgames on the radio. In his retirement years, he would take his portable radio out into the yard, plug it into the outlet from the yard lamp, get settled in his lawn chair under the shade tree, read the newspaper while listening to the game, and fall asleep in his chair before it was over! But he could always tell you who won! Apparently, this day in 1951, the Indy 500 was also on the radio. Lee Wallard, who started in 2nd position, did indeed win this race. There were only 8 cars still running at the end of the race, and Lee’s car was in pretty bad shape — he sort of limped into the win. His prize money totaled $63,612. By the year 2000, the prize money was $1,235,690. Today it’s over $1.5 million . . . amazing, huh? The 94th Indianapolis 500 is being run this very day, May 30, 2010, at the Indianapolis Motor Speedway. The favored pick to win is Helio Castroneves, who has already won this race 3 times before. 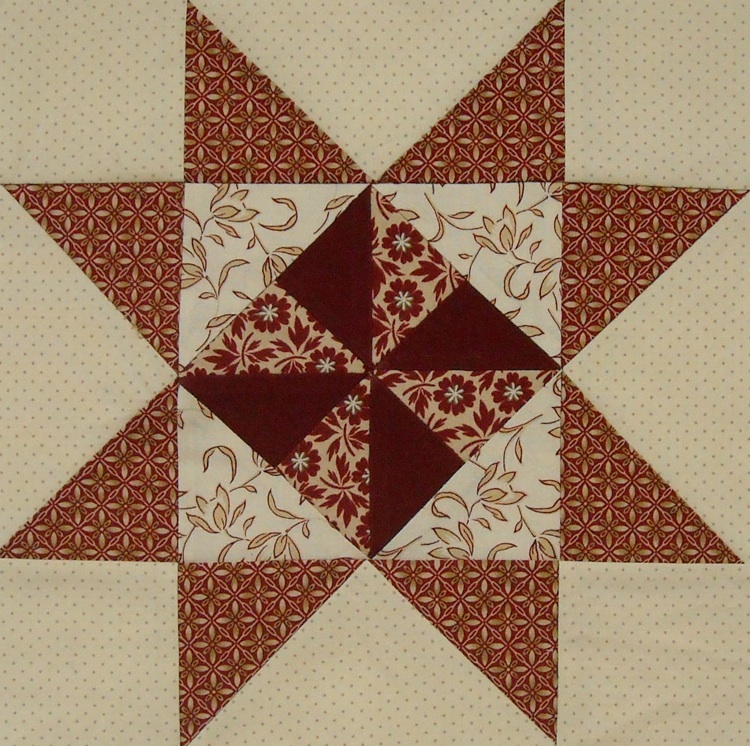 While you’re watching the race, you can quilt. 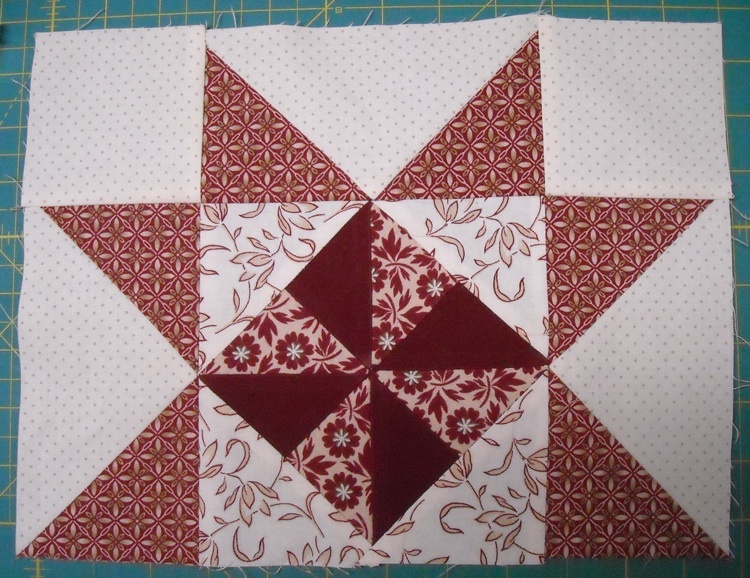 Today you need the squares you cut yesterday and the two remaining Flying Geese units from your “Block 7” baggie. Lay them out as shown. 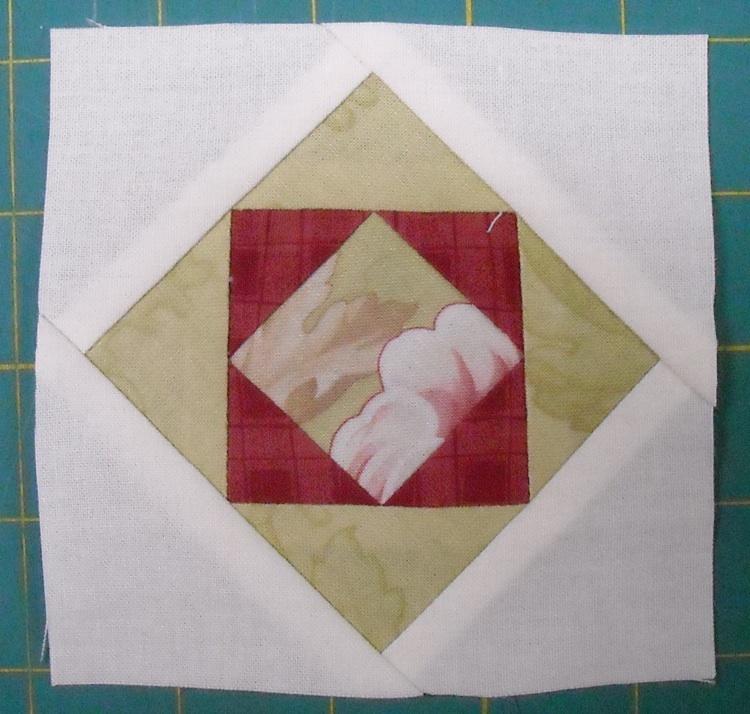 Sew a left square to the Flying Geese unit. Press the seam toward the square. 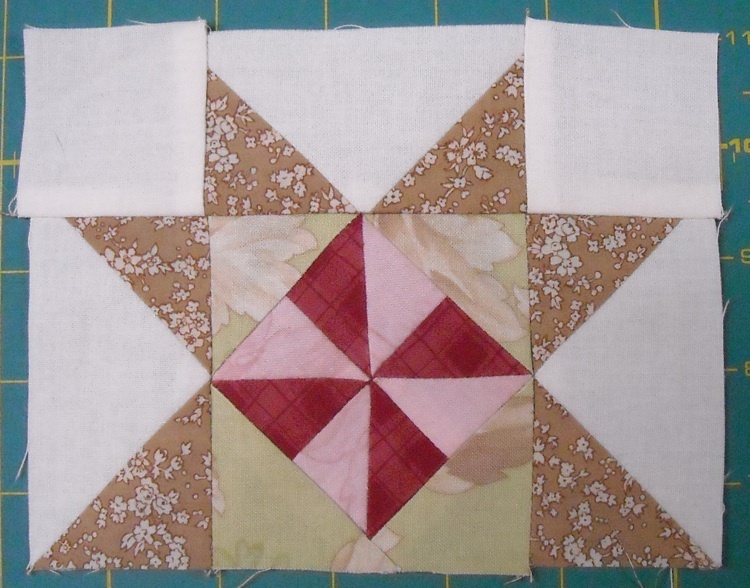 Add the other square to the right side. 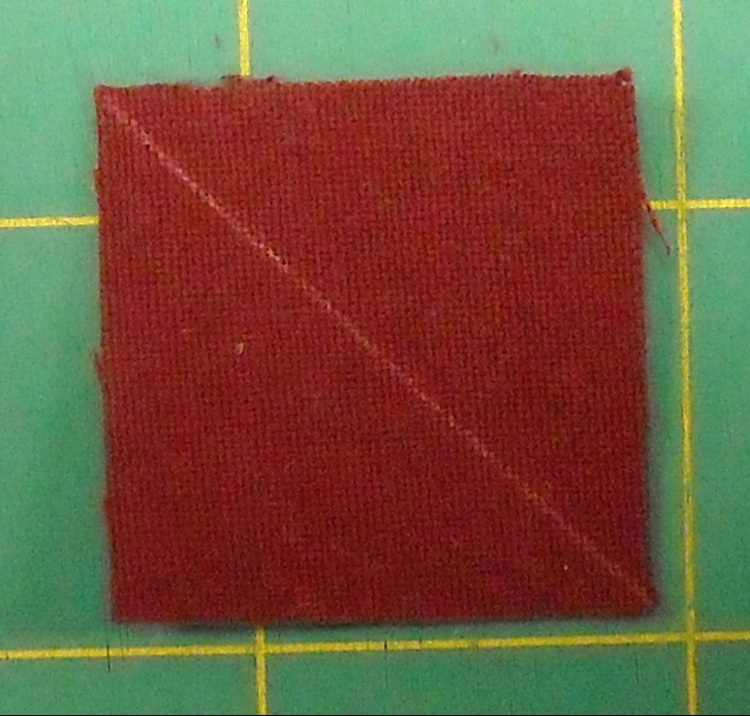 Press the seam toward the square. Repeat for the remaining set of pieces. 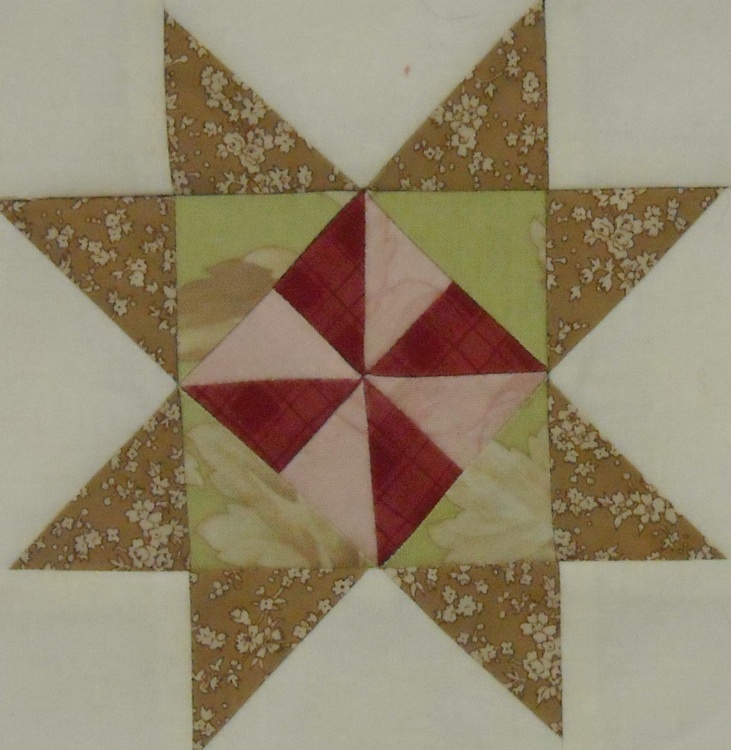 Now you’ll also need your pinwheel/Flying Geese section from the “Block 7” baggie. Lay the rows out together as shown. Flip the top row down onto the middle row, right sides together. 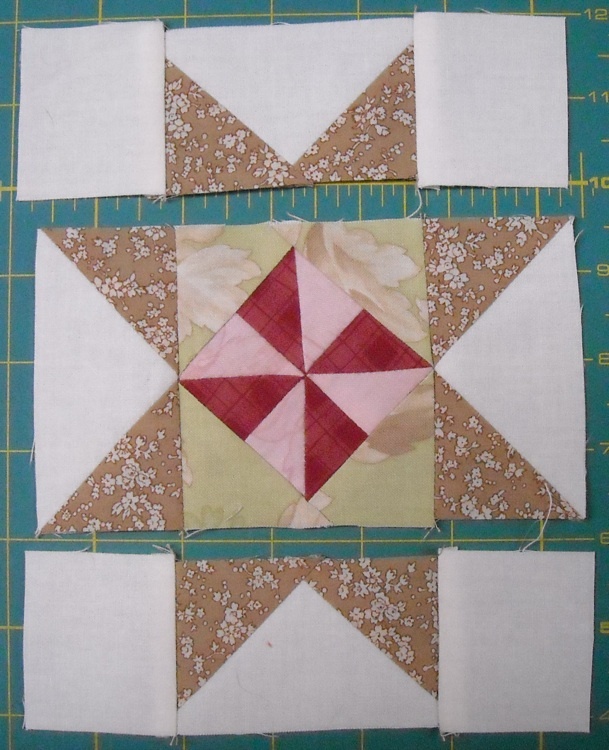 Match the seams carefully, especially the center points. Pin in place. Stitch. Press the seam toward the top, or open, if you prefer. 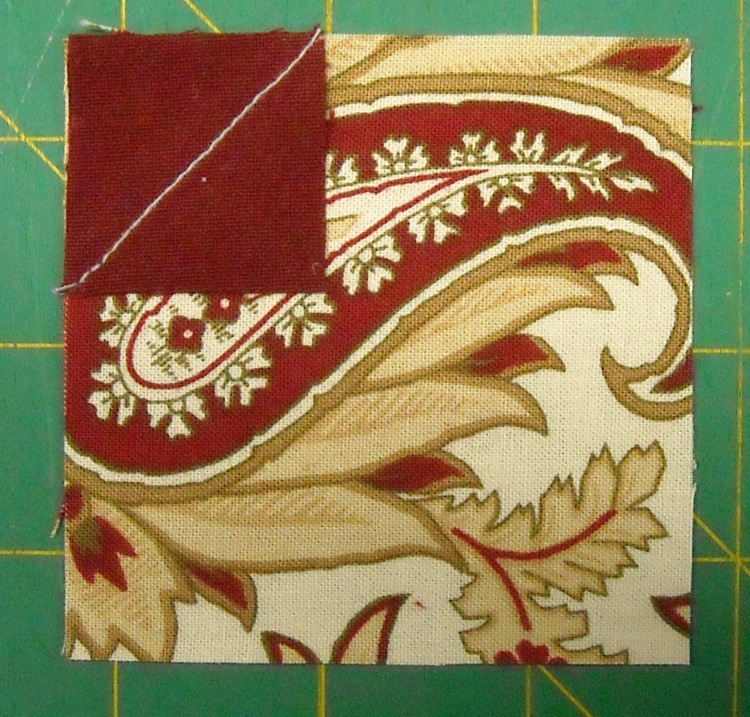 Add the bottom row in the same manner, again being careful to match the seams. Press the seam toward the bottom, or open, whatever you prefer. You’re now finished with Block 7 — are you excited? When you’re all done, don’t forget to go post a picture of it on the Flickr Group page. I want to see them! Momma & Daddy went to Macon to a banquet at the Jefferson Hotel. We are over at Grandma’s and Grandpa’s house. Grandma made fudge and puffed rice balls. President Truman fired Gen. McArthur. More and more families are praising our coffee shop as the place to bring the family when they eat out. The quiet unhurried atmosphere — the generous portions of well-prepared food — the air of cordiality — plan now to dine out Sunday. “Cordiality” . . . there’s a word you don’t hear too often these days! Their “Complete Sunday Dinner” was priced at $1.50! Wouldn’t you love to eat out for that price these days? And Hot Rolls . . .
For Dessert, you could pick from: Lemon Pie — Chocolate Parfait — Lime Sherbet — Vanilla Ice Cream — Cherry Tart with Whipped Cream. Just call 2112 for your reservation — It’s only $1.50! It’s making me hungry! While the parents were out having a feast, the kids were with Grandma and Grandpa, where it seems there was no shortage of goodies to eat. I always think of fudge and candy recipes around Christmas time, but here it is just after Easter, and they’re whipping these things up like it’s nothing. So . . . I’ll share with you the recipes anyway. I guess it’s OK to have candy any old time you want! Mildred always made her fudge using the recipe off the back of the marshmallow creme jar. Since I don’t know what recipe her mother would have been using, I’ll share Mildred’s, and you can find it here: Fantasy Fudge. As for the Puffed Rice Balls, she had two recipes for those, so my sister and I picked the easier one that’s less work to share with you. I tried them, and they didn’t turn out too bad — plus, they didn’t take long to make at all. Mix peanut butter, honey, and 1 cup of the Rice Krispies together. Put the other 2 cups of Rice Krispies in another bowl. Make the peanut butter mixture into little balls and roll the balls in the Rice Krispies in the other bowl until they’re coated. It made about 15 balls. I just laid them out on waxed paper, and then stored them in a container in the fridge later on. Oh, and about the other big news on this day . . .
Douglas A. MacArthur was fired by President Harry S. Truman on the grounds that “the 71 year old hero of World War II had demonstrated inability to give wholehearted support to United States and United Nations objectives in the Far East.” He was replaced by Lt. General Mathew B. Ridgway. There would be headlines regarding this incident in the papers for weeks to come . . .